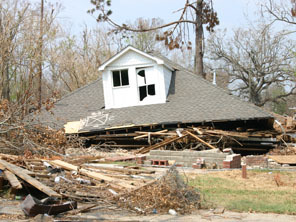 The traditional American single-family house is not designed to withstand disasters. Ideally a house should offer good protection from floods, fires, earthquakes, storms, civil unrest and financial difficulties. Most houses today are designed with substantial input from building contractors who have the primary goal of selling for the highest price; other concerns are not even a remote consideration. Residential and mixed-use buildings that can be constructed for both low-income and middle income occupants can assist inner city builders with developing on infill lots. High security can be an important consideration in urban environments, so the disaster resistant project examines ways to enhance security. The disaster resistant building project offers suggestions about how the design of the typical North American house, small apartment building and small commercial building can be modified to increase the ability of the occupants to withstand natural disasters, crime, and financial crisis. Aesthetics are not the primary feature in this project, so the designs may be accurately described as non-design oriented. The focus is reformulated space planning and structural design. The basic principals, beginning with the foundation, include designing the entire first floor to withstand hurricanes, water damage and fire damage. This means introducing the use of concrete or concrete blocks at least for this area if not for the entire building. Build at least one full story above the one hundred year flood plain. If you are in earthquake country, insist on more than minimum allowable seismic design. It is important to lift the entire primary dwelling areas along with the utilities to the second level, or higher. The ground floor is best used for parking and for a secondary dwelling unit. Use attics or half stories, building with rafters rather than roof trusses, to add substantial, usable square footage to your building for very little additional cost. Build with a floor plan that allows for flexibility of use, so that the space can be modified as your needs evolve. Allow room for a potential future rental unit even if you never intend to have tenants. If not used to create cash flow, it still might come in handy for use by friends or family members, or as quarters for a live in nurse or domestic assistant. If planned in advance, the secondary unit can be made operational without any structural remodeling. Finally, the use of fireproof roofing is recommended. In addition to these general principles there are numerous features that are added to the design to further enhance the disaster–resistant quality of new construction such as; Sturdy, and operable shutters, access to the roof and roof decks, enclosed outdoor play areas for young children, and the ability to easily divide the house into apartments without remodeling. The concepts in this project can be fully applied to any new small building construction. When renovating an existing building it is possible to add disaster resistant design principals. Bolt sill plates to the foundation. Use flexible connections on gas and water lines. Ensure that there are adequate shear walls. Avoid building in a floodplain or in an area that could experience wave action. Elevate the primary dwelling areas above the base flood elevation “b.f.e.”. Locate the furnace, water heater, and electrical panel above the “b.f.e.”. Seal walls in the basement with waterproofing materials. Install a foundation drainage system. Install a sump pump for floors that are below grade. Install backflow valves in sanitary and storm lines. Strengthen walls to withstand floodwater pressures. Anchor the building to the foundation so that it will resist flotation. All hardware below the b.f.e should be stainless or galvanized steel. Build with flood resistant materials below the b.f.e. Install shutters at all windows. In areas prone to hurricanes, have doors facing potential high winds open out rather than in. Cover house vents with ¼”, or smaller, corrosive resistant wire mesh. Install chimney and stovepipe spark arrestors. Use safety glass and non-combustible shutters at windows. Create an external water storage supply. Install ground cover on slopes. Build retaining walls at slopes. Build deflection walls or channels in potential mudflow areas. Install flexible pipe fittings for gas and water lines. The small building concept titled “The Urban Special” is the first prototype that incorporates the principals of disaster-resistant design.